Semi content to surpass 30% this year, smashing the previous record high set just last year. July 18, 2018 -- In its upcoming Mid-Year Update to The McClean Report 2018 (to be released at the end of July), IC Insights forecasts that the 2018 global electronic systems market will grow 5% to $1,622 billion while the worldwide semiconductor market is expected to surge by 14% this year to $509.1 billion, exceeding the $500.0 billion level for the first time. 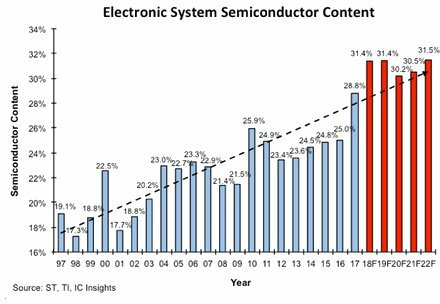 If the 2018 forecasts come to fruition, the average semiconductor content in an electronic system will reach 31.4%, breaking the all-time record of 28.8% that was set in 2017 (Figure 1). Historically, the driving force behind the higher average annual growth rate of the semiconductor industry as compared to the electronic systems market is the increasing value or content of semiconductors used in electronic systems. With global unit shipments of cellphones (-1%), automobiles (3%), and PCs (-1%) forecast to be weak in 2018, the disparity between the moderate growth in the electronic systems market and high growth of the semiconductor market is directly due to the increasing content of semiconductors in electronic systems. While the trend of increasing semiconductor content has been evident for the past 30 years, the big jump in the average semiconductor content in electronic systems in 2018 is expected to be primarily due to the huge surge in DRAM and NAND flash ASPs and average electronic system sales growth this year. After slipping to 30.2% in 2020, the semiconductor content percentage is expected to climb to a new high of 31.5% in 2022. IC Insights does not anticipate the percentage will fall below 30% any year through the forecast period. The trend of increasingly higher semiconductor value in electronic systems has a limit. Extrapolating an annual increase in the percent semiconductor figure indefinitely would, at some point in the future, result in the semiconductor content of an electronic system reaching 100%. Whatever the ultimate ceiling is, once it is reached, the average annual growth for the semiconductor industry will closely track that of the electronic systems market (i.e., about 4%-5% per year). The 250+ page Mid-Year Update to the 2018 edition of The McClean Report further describes IC Insights’ IC market forecast data for 2017-2022. Additional details on the IC market forecast and other trends within the IC industry will be provided in the Mid-Year Update to The McClean Report—A Complete Analysis and Forecast of the Integrated Circuit Industry (released in January 2018). A subscription to The McClean Report includes free monthly updates from March through November (including a 250+ page Mid-Year Update), and free access to subscriber-only webinars throughout the year. An individual-user license to the 2018 edition of The McClean Report is priced at $4,290 and includes an Internet access password. A multi-user worldwide corporate license is available for $7,290. Fill out this form for contacting a IC Insights, Inc. representative.